I had a much different blog planned for today… but sometimes life throws you something you just have to get out… So here is today. Maybe tomorrow will bring something different…. Many ask… “So what do Missionaries like your family actually do and how do you live?”. Fair, but loaded question. There are many misconceptions surrounding the lives and activities of missionaries. Especially ones like us. I posted a picture once on facebook and someone mentioned that it was gutsy of me to post a picture of my house since the photo had our tv in it. At first I thought the comment was strange. But after talking with Geoff we realized that we are a tad bit under scrutiny for what we have considering the connotation that comes along with the title “Missionary”. I can tell you we do not live in mud huts and ride donkeys. We live in a rental house just outside of the town we serve in… We have beds, toilets, showers and running water (now). Yes we have a tv… and we have xbox… and we have a ping pong table… and board games…. and a dvd player… and a stereo…. and many other such things. Our actual living conditions are not that much different than what we had in Canada. Albeit there are many subtle differences. I do not have a clothes dryer… nor an electric can opener… nor a dishwasher…. etc etc… Missing are many, but not all, of the conveniences of North American life. But most of those we actually do not miss. Many deep and meaningful conversations happen here over a sink full of dirty dishes… or hanging wet laundry… We work together and consider every moment, even those in work, as meaningful time spent together. What do we do? Hmmm…. that is where things get tricky. I read a blog post once by a woman who calls herself “The Very Worst Missionary”. She wrote what I am sure rang true with many missionaries who read it. It said, and I am paraphrasing here…. We rely on donations. And people want results. And we get them… BUT…. some days are full of unclogging toilets … how do you “sell” unclogging toilets? I know we all feel that sometimes. Like every day there should be something huge to report… some miracle… some HUGE event. Unfortunately we learned quickly that many, if not most days are just that…. unclogging toilets. Ok, maybe not actually unclogging toilets (although that does happen quite a bit around here and at the Hospital), but doing menial everyday tasks. We are not tallying ‘lives saved’ or ‘people converted’. These numbers so many covet simply do not exist. We do our thing, the thing that God sent us here to do. Yes there are projects… and these projects sometimes take a frustratingly long time. Delays are common here… Siesta happens every day from 12-2pm and nothing happens during that time! We do visa runs (some unsuccessful)… city runs for supplies… airport runs to get volunteers…. visiting sick…. interviews of families, children and villagers. Sometimes things are quite tedious and boring. Standing in line upon line to do a task as simple as banking or some other small task. Sitting for hours doing reporting paperwork…. etc etc… Sometimes what we do simply consists of listening to someone, or holding them when they cry. Today we visited the Hospital. All but 5 of the Hermanas are away visiting their families for 1 week. We wanted to check in and see how things were. The door that is normally open was locked tight because the young Hermanas left behind to watch over the children are alone and a bit nervous. We knocked and were greeted by a miracle. 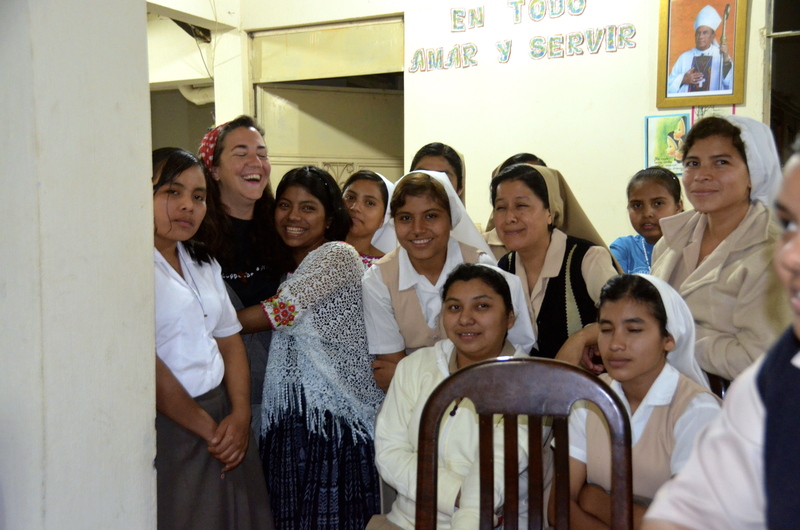 Concepcion is a young girl who was at the hospital studying to possibly join the community of nuns last year. She got ‘cold feet’ so to speak and left to return to her family. We missed her terribly, especially me. She is such a bright and happy young girl and always greeted me with such a huge smile and an even bigger hug. This year when we arrived I was very sad she was not there. So, imagine my surprise and delight today when she opened the door!!!! She gave me my hug and quickly left to the kitchen and began cleaning. Something was missing in her today. All of us felt it but being a mom, I knew instinctively there was something much more going on with this quiet, and completely abnormal behaviour. We kept calling her in to sit and talk but she kept on working quietly. Having finished her story… tears began to run down her face. I stood up and held her. She immediately held me tight and began sobbing in my arms. All the fear and sadness came out in those minutes that I held and soothed her. I cried with her and told her I loved her. Everyone in the room was silent as her and I shared a moment together. After a few minutes we broke and she began to giggle at things Zack and Hermana Viviana were talking about, trying to lighten the mood and cheer her up. Within a half hour, my Concepcion was back. The sparkle back in her eye… she had fully returned to HER community…. to US. I am thankful that I pressed her to open up… I am thankful that I could be her mom, even if for a few moments when she needed one desperately. Posted on January 13, 2014, in Guatemala Missionary, Uncategorized and tagged celebrate life, friends, grief, Guatemala, Hope, Malnutrition, mission, nutrition, Volunteers, World Impact, Youth. Bookmark the permalink. 3 Comments. Rita!!! So beautiful and so full of Spirit!!! I know what you mean. This is what I am doing too… No matter how bizarre my choices may seem (to myself even, at first!) I am doing what God asks of me. I can’t wait to be working with everyone so soon! I can’t wait to meet Concepción, she sounds like a lovely lady… Dios te bendiga! Yay!! !